as you can see in the above image there is an option called Units. What is Units: Units feature, allows you to leverage the group as a platform for online course content or to simply organize your posts by topic, for more details check this link. 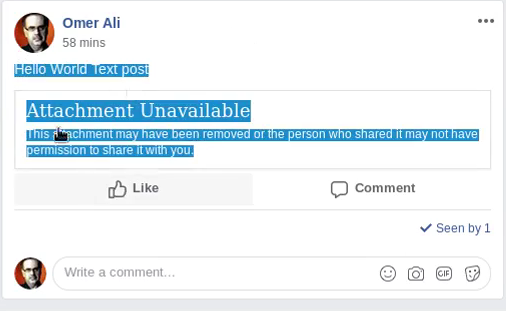 Note: Only admin of group can create, edit, delete or add post in the Units. 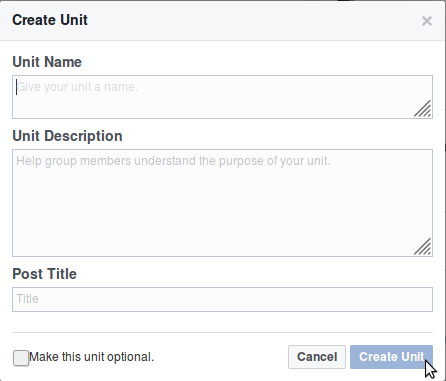 1-what will happen if I change my group_id value to another group id (victim group), is it possible to create new unit and add my post (Live video post) in the other group (victim group). 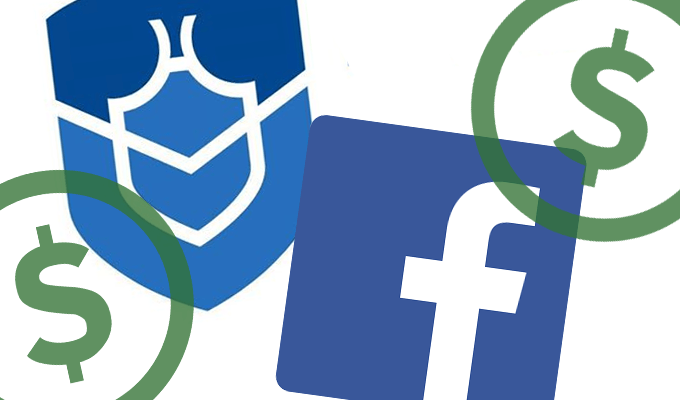 2- what will happen if I change my post_id value to other post id from another group (victim group), is it possible to add posts from other group (victim group) to my unit in my test group (attacker group). 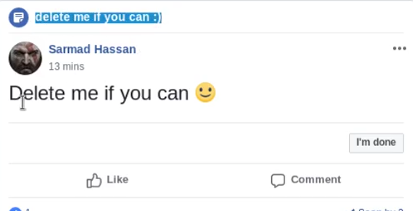 as you can see above, I was able to Distort post (only text post) in victim group and make it look like the above ugly form. as you can see above, I saw my unit title appear in my post in the victim group, hmmm that’s weird, when I tested the bug in the first victim group I saw “Attachment Unavailable” , but when i tested it again in another victim group (noobs group), I was able to put the title of my unit above any post and make the post undeletable by its owner and by admin of the group, that’s really weird right!!!! 1- Attacker can Distort only Text Post in victim group for any member (Admin, Moderator, normal user), if the owner of the post is not a member in the attacker group. 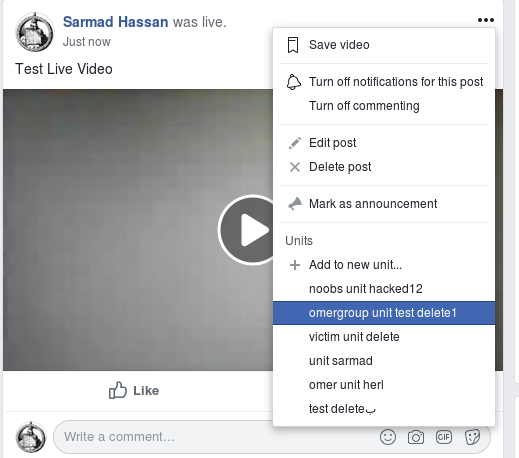 2- Attacker can make any post (Photo, Video, Events ..etc) for any member (Admin, Moderator, normal user)in victim group Undeletable and also can put title of his unit above the vicim post, by just inviting the owner of the post in his group (Attacker group). when I saw that video it was the same bug but from different end point, at the same time I was shocked wtf!! 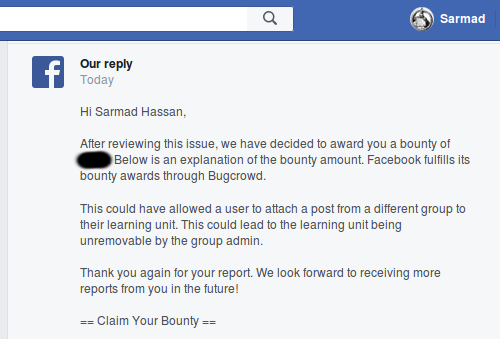 !, I said if he disclosed the bug in youtube it means the bug is fixed, but to make sure let’s search for this researcher and contact him, so I found his facebook account and I talked to him about the bug, I told him that the bug is still working, he told me the bug is fixed and facebook had already rewarded him bounty for that, I also informed Facebook Sec. Team about the whole story. I just want to thanks Richard Telleng (The researcher who found the bug before me) for his honest and politeness, you’re really a great guy, thank you so much for your huge support, I really appreciate that my bro. 1- Try to check the option that you’re testing from different areas, there is a chance that you will find something interesting in it. 2- If you faced the same situation that I faced, try to contact with the other researcher, asked him whether the bug is fixed or not, and just be honest with him. 3- Be honest with the Security Team too, just to make sure every thing is clear.